WBZ reports on the crash at Bennington and Vienna streets around 5:30 a.m. Both were taken to the hospital - the woman with physical injuries not considered life threatening, the trooper with emotional distress. 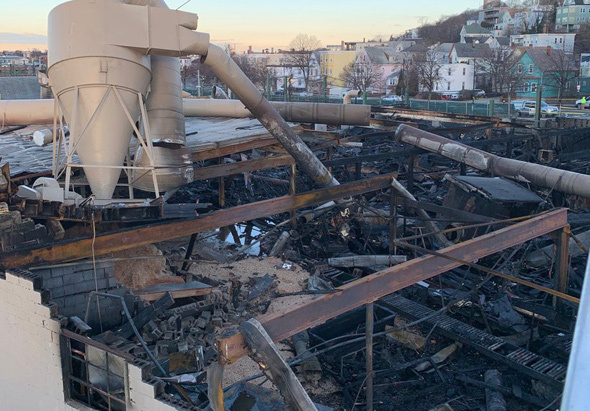 Boston firefighters remained at what was left of the New England Casket Co. this morning, continuing to hit hot spots with water to prevent any flareups of the nine-alarm fire that broke out around 3 p.m. yesterday, sending fire out windows and the roof well into the evening. Read more. See it larger. 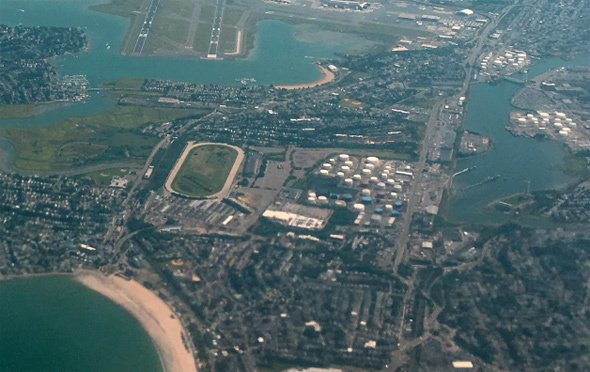 Photo by Kim CV, landing at Logan shortly after 5 p.m.
Update, 10:25 p.m. Nearby residents being allowed to return to their homes. 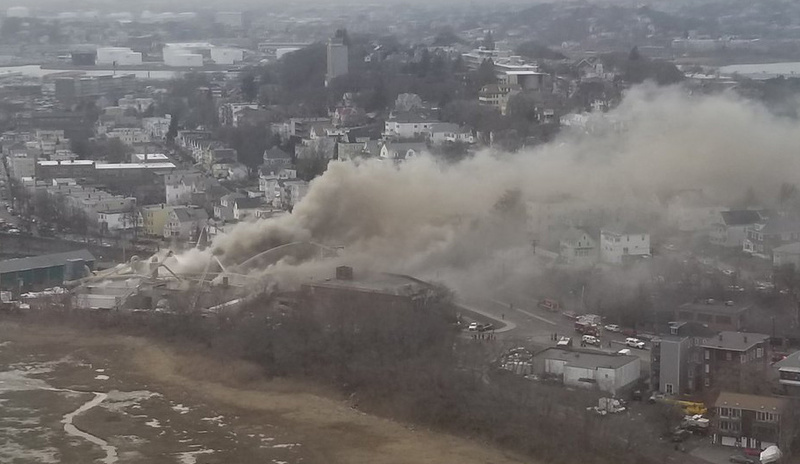 A fire that erupted on the roof of the New England Casket Co., 1141 Bennington St. in East Boston shortly after 3 p.m. spread throughout the building and spewing toxic smoke that forced the evacuation of nearby residents as it went to nine alarms. Read more. La Chiva, a Colombian take-out place at 259 Bennington St. in East Boston that is already open until 3 a.m., is seeking permission to stay open 24 hours a day. Read more. The Boston Licensing Board voted yesterday to roll back the closing time at three liquor-serving establishments in East Boston's Central Square from 2 a.m. to 1 a.m. because of repeated closing-time problems that have included fights and robberies that police said were cause in large part by people rolling into the area for last call after the bars close at 1 in Chelsea, Revere and Winthrop. Read more. The Boston Licensing Board decides Thursday whether to roll back closing time from 2 a.m. to 1 a.m. for Bohemios and Billares Colombia on Bennington Street and La Gran Manzana, Central Square, after a hearing today at which A-7 Capt. Kelley McCormick and Sgt. Tlaloc Cutroneo testified they are fed up with babysitting an area that for two hours every night fills up with drinkers stumbling around, getting into fights, getting mugged, urinating in a parking lot and just generally causing a ruckus that is a headache for residents of the dense area. Read more. The Boston Licensing Board is considering rolling back closing time at La Gran Manzana in Central Square and Bohemios and Billares Colombia on Bennington Street from 2 a.m. to 1 a.m. because of repeated problems, including fights, car crashes and OUI arrests in the hour before they now close. Read more. On Bennington Street, between Moore and Byron streets, around 10:50 p.m.
After hearing reports of violent closing-time incidents outside a cluster of Bennington Street bars, the Boston Licensing Board said today it would haul the bars in for a hearing to determine what's going on and what to do about it. Read more. When the two licensing detectives walked into Billares Colombia on Bennington Street around 12:40 a.m. on Jan. 15, an employee who had been overseeing shots of aguardiente fled, leaving the bottles just sitting on a pool table, where anybody could drink from them. Read more. 300 Bennington St., at Chelsea Street, around 10:40 p.m. The suspect is described as white, 5'6" or 5'7", wearing a black North Face jacket with a fur hood over a red hoodie and a black face mask. Police arrested three men, a large TV got smashed and a bouncer had to use a chair as a shield against other chairs being thrown his way when a fight between fans of rival soccer teams at La Terraza, 19 Bennington St., escalated early on May 19, police and restaurant workers testified today. Read more. Napoles, a Colombian restaurant and bar (with a lot of Italian items and a really nice pool table) on Bennington Street in East Boston, kept the "crashed" plane that was a hallmark of the Jimmy Maggs restaurant that preceded it. The Boston Licensing Board tomorrow decides whether to let Bohemios Restaurant, 30 Bennington St., sell entire bottles of wine to customers, rather than individual servings. Read more. Around 1:35 a.m. at 90 Bennington St., Stanley Staco and Rick Macomber report. Boston Police report the arrest of Walter Hernandez Luna, 39, for the stabbing. Boston Police report officers responding to a report of a man with a gun at a triple decker on Bennington Street between Putnam and Prescott Thursday night stumbled on a cache of drugs and weapons that included Read more. Usually trucks get stuck where Neptune and Bennington streets and Rte. 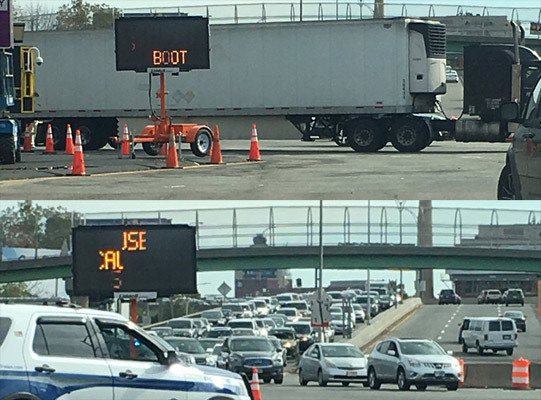 1A come together, but today's truck-related jam up, Eastie Strong shows us, was at the Sumner Tunnel entrance.